Toneeke grew up in a family of 10 siblings; she learned to be creative early in childhood. This ultimately inspired her creative life. Art is part of the curriculum in the schools of the Western states making it an added inspiration and source of knowledge for Toneeke. Being inspired by the different mediums In Jr High School, Toneeke was able to absorb the techniques quickly, where her watercolor portrait won a Golden Art Scholarship and Key Award, traveling with the high school art show across the states. That was just the beginning. Toneeke has continued that creative path for many years. 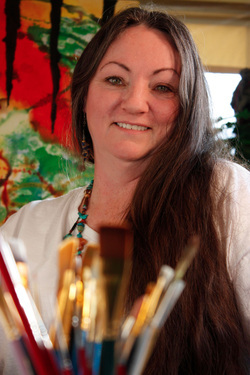 Establishing recognition and awards for her art through National and Regional Juried Shows, solo exhibits and artist in residency. Toneeke has always loved the method of layering any medium - watercolor, mixed media, paint - feeling excited and unconstrained by how it all transforms into art. Texture allows Toneeke to work with her hands, feeling the ridges and patterns take shape as she works with the materials. Rather than consciously thinking what she wants the work to be, Toneeke often closes her eyes to apply the layers. This gives her a sense of a mystery to work with. It is amazing to know that what is created can be felt by the viewer, even if not by physically touching the work. share your passion, your journey, your art, and a smile.